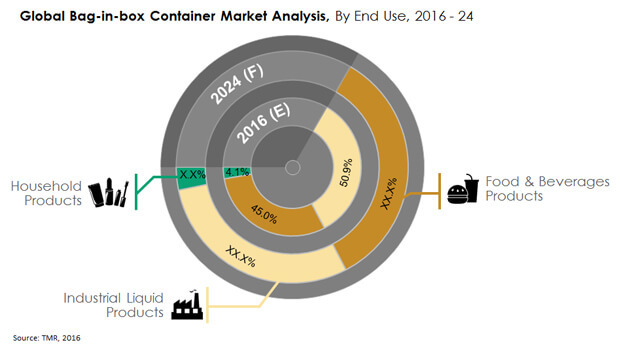 A noticeable trend in the global bag-in-box containers market is the growing thrust by a large number of players on capacity expansion, while trying to conquer new markets in different regions. They are also making efforts to come up with cost-effective solutions for applications such as dairy products, smoothies, cereals, and liquid detergents. Further, manufacturers are adding new features to containers such as changeable liner bags and aseptic liner bags. Options such as sight glass, which allows the user to check the contents and filling levels and dropside package have also been introduced in the market, explains a report by Transparency Market Research. Some of the prominent vendors in the global bag-in-box containers market are Optopack Ltd, Smurfit Kappa Group, CDF Corporation, DS Smith, Scholle IPN, Amcor Limited, Liqui-box, and TPS Rental Systems Ltd. The TMR report forecasts the market to rise at a 6.5% CAGR from 2016 to 2024. Depending upon end use, the global market for bag-in-box containers can be segmented into food and beverages industry, industrial liquids packaging companies, and household applications. Among them, the food and beverages sector leads with over three-fourths of the share in the market. This segment is comprised of non-alcoholic beverages, alcoholic beverages, and liquid foods. Going forward, however, the household applications segment is slated to gain maximum market share by overtaking all others with a 8.8% CAGR. Depending upon geography, the global market for bag-in-box containers can be divided into Asia Pacific, North America, Europe, Latin America, and the Middle East and Africa. Of them, Europe is a market leader in terms of revenue. Latin America, on the other hand, is predicted to outshine all other regions in terms of growth rate by clocking a CAGR of 8.0%. Robust demand in Asia Pacific, powered primarily by the fast-expanding emerging economies of China and India that have been seeing an explosion in the food and beverage industry, will boost the market in the region as well. Most manufacturers, sensing an opportunity, are investing in these countries. “The demand for aseptic and convenient packaging formats on the part of the consumer and the need to reduce per-package cost price on the part of the manufacturer are the prime factors behind the emergence and rising adoption of bag-in-box containers across industries. Bag-in-box containers, as against conventional packaging solutions, provide improved hygiene and safety features in addition to greater convenience in packaging, storage, and transportation, and low space utilization,” explains the lead analyst of the report. The market would likely receive a setback on account of the introduction of competitive alternate products such as cubitainers. “Cubitainers are an economical and space-saving way of storing, transporting, and dispensing liquid products such as reagents, cooking oils, chemicals, buffer solutions, and soaps and detergents. The advantages of cubitainers over conventional bag-in-box containers are many, which poses a severe threat to the bag-in-box containers market,” elaborates the analyst of the report. However, the soaring demand for bag-in-box containers for wine packaging is predicted to help overcome growth the challenge and place the market on the growth trajectory again. Another factor acting as a restraint to the market is the additional equipment costs associated with bag-in-box container packaging that will likely hamper their uptake in several end-use industries, particularly those in the developing countries of the Middle East and Africa and Asia Pacific.